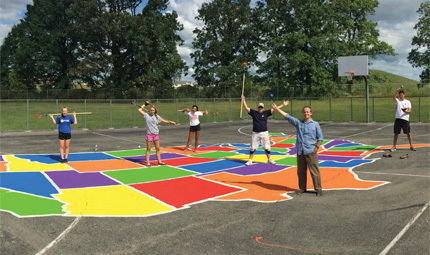 Olentangy Club Members have painted 12 large scale 50 ‘ x 150’ maps of USA at the elementary schools within the Olentangy Local School District. This particular picture was featured in The Rotarian Magazine. Interact is Rotary International’s service club for young people ages 14-18. Interact clubs are self-governing and self-supporting but are sponsored by individual Rotary clubs, which provide support and guidance. There are more than 250,000 Interactors in more than 130 countries and geographical areas. The Interact Club of Olentangy Liberty High School was officially chartered on Tuesday, October 23rd 2007 with an induction ceremony in the high school library. The Interact club, sponsored by the Olentangy Rotary Club, was formed to fill the increasing need for service clubs in the school, and currently has close to 60 members. Interact is a service club for young people ages 14-18. Interact goals include developing leadership skills and personal integrity, demonstrating helpfulness and respect for others, understanding the value of individual responsibility and hard work and advancing international understanding and goodwill. Jennifer Carney is the Olentangy Rotary Club Chairperson for the Liberty High School Interact club.